If you heard my recent rant on Podcast 13, my main beef was with the state of monitors to the end user. With 5 inch 1080p screens becoming the norm, finding a monitor that could show above 1920x1080 in anything less than 27” was quite rare. An idea thrown around in the Podcast was to place four 1080p 10” tablet screens in a 2x2 arrangement and sell it as a monitor, even if consistency between panels was an issue – this would give 4K in 20”, a form factor that Panasonic showcased at CES with a tablet (albeit with a single substrate). Thus the only way to get 4K on a home system would be to rig up four small 1080p monitors (small being 20”) and connect them to an applicable graphics setup. One of the goals of Intel’s HD graphics via a processor is to support 4K resolutions. As part of the CES showcase, Gigabyte demonstrated how they can support 4K via the Intel graphics solution on their motherboards that use two Thunderbolt ports. Back at Computex 2012 Gigabyte gave us a look at their dual Thunderbolt-enabled motherboard range, and we reviewed the Z77X-UP4 TH soon after. Each of the Thunderbolt ports complies with the DisplayPort 1.1a standard, giving support for 2K from each. It has taken since then for Intel to release a driver capable of splitting a 4K stream into separate 2K streams, and Gigabyte put the system together for journalists to see. The driver supports a number of 4K resolutions, including 3840x2400 (1200p in 2x2), 3840x2160 (1080p in 2x2), 7680x1200 (1200p in 1x4) and 7680x1080 (1080p in 1x4) with variations therein. 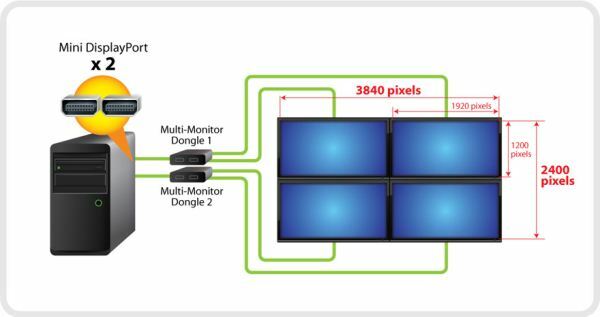 In order to support this, the end user needs four DisplayPort enabled monitors, two DisplayPort to Dual DisplayPort adapters, the relevant cables, and if needed, a monitor stand. A ball park figure for this setup could be around $1400 for cheap displays, making it a relatively simple way to enable 4K using HD Graphics only. There are a few caveats. Firstly, the collage driver from Intel is not on final release as of yet, but expected to go live in the next month. When it does, Gigabyte will have a version on their website for each of their boards. Another caveat is the infancy of the driver – there is no bezel correction on the version that Gigabyte used, and it is unknown if it will be supported at release. The final caveat is compatibility – in Gigabyte’s testing of the few DisplayPort to Dual DisplayPort adapters they could acquire in Taiwan, only the one from Lenovo worked for them. There is a possibility that many more do work, but they are as-of-yet untested. Also, the one from Lenovo is only rated to 3840x2160, meaning 1200p monitors are off the table in that setup. As for the system to power it, any compatible motherboard and HD4000 graphics combination with memory, case, storage and power supply. The following is almost the bare minimum, though with memory cheap I went for a dual channel setup, and on the storage side I went for an mSATA SSD as the motherboard chosen supports it. A couple more points to note. ASRock have released a dual thunderbolt motherboard as well (the ASRock Z77 Extreme6/TB4) so it should work on that. Also, this setup is using DisplayPort 1.1a – DisplayPort 1.2 should be able to support 4K over a single cable when it is released with the Redwood Ridge Thunderbolt controller. DisplayPort 1.2 should be able to be daisy chained if monitors have dual DP 1.2 support, but a DisplayPort to Quad DisplayPort device might need to be invented to get around problematic daisy chaining. Any idea if those Lenovo Displayport to Dual Displayport adapters will work with most any system? Last I checked AMD's 4K decode was broken, but the ability to drive 2x2 displays was there. NVIDIA can handle decode with Kepler, but can't output to more than 3 displays in a single large surface configuration.